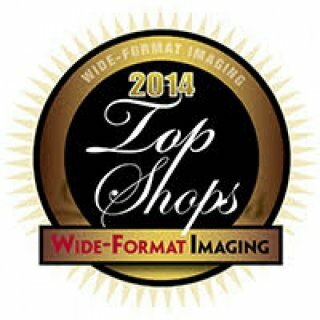 (NASHVILLE, Tenn.) April 4, 2014 — Big Visual Group has been designated as a 2014 “top shop” by industry-leading publication, Wide-Format Imaging magazine. Big Visual Group moved up three spots this year, ranking #17 out of the 40 top shops recognized nationally, and the only top shop in Tennessee. Earlier this year, Big Visual Group took home multiple awards from the 2014 FASTSIGNS International Convention, held in Anaheim. Among the growth and achievement awards received, Big Visual Group was named the number one business, out of the entire 530 location network, for its record-breaking sales levels. Big Visual Group is celebrating 20 BIG years in Nashville. Their 40,000 sf state-of-the-art facility in The Crossings area is open Monday through Friday for tours. Big Visual Group is a custom sign company in Nashville that produces large and grand format prints, custom banners, fleet graphics and vehicle wraps, architectural and three-dimensional signs, digital signs, trade show and event displays, point of purchase materials, building signs, and musical instrument wraps of all kinds. According to the most recent Inc. 5000 list, Big Visual Group is the fastest growing sign company in America and the top sign company in Tennessee. Big Visual Group is G7 Certified for color accuracy. To learn more, call 615-731-3700, or visit them online at www.bigvisualgroup.com.